Right-wing Republican Party-linked think tanks want to eliminate Social Security. They are using a recent report from the Social Security trustees that indicate the recession has harmed the long-term financial security of the program’s trust fund to claim the program needs reform, i.e. privatization, slashing benefits and raising the retirement age. Financed largely by Wall Street interests, these groups basically want to get their hands on the money in the Social Security trust fund. Despite the collapse of the banking and investment industry, they still insist that the private market can better provide retirement security for America’s seniors than the Social Security program. Of course it is plain to most Americans that had 64 million retirees been forced to rely on the private banking and investment industries for their financial security over the past six months, many millions of them would have been forced into dire poverty. The loss of about 40 percent of value in the stock markets since the financial collapse would have devastated millions of privatized Social Security accounts. No thoughtful person should believe the private banking and investment marketplace can or should be relied on to play the same role Social Security now plays: providing a basic minimum income for retired Americans. By contrast to the Wall Street meltdown, the new financial picture painted by the Social Security trustees registers as little more than a blip on program’s long-term radar screen. According to noted economist Henry J. Aaron of the Brookings Institution, the recent decrease in trust fund revenue will account for less than a few one-hundredths of one percent decrease in the 75 year projection for the Social Security Trust Fund. In fact, negative portrayals of Social Security’s financial health rely on arbitrary and distorted claims of how it works. High unemployment and underemployment, along with wage stagnation, have harmed the level of payroll taxes that finance the Social Security Trust Fund over the past year. The loss of almost 6 million jobs in a very short period of time will do that. No one presumes that this situation is permanent. Despite recession, however, the surpluses in income over the payout of benefits have created a trust fund worth trillions, which will be able to pay the current level of benefits to retirees for many decades to come. In fact, in terms of cost effectiveness of the program and its irrefutably secure financial condition, Social Security is one of the strongest and most reliable federal programs around. If any reforms are ever to be needed in the program, the first principle must be to avoid putting at risk the program’s basic goal: to provide a basic income for retired Americans. There is one reform, however, that might adhere to that principle while strengthening the program’s financial footing: lifting the cap starting with the highest incomes. Right now the payroll tax that finances the program is capped at $106,800. 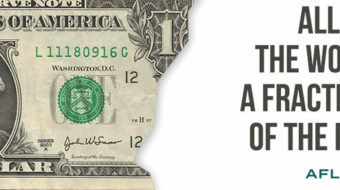 This means that for the wealthiest Americans, ever dollar over that amount goes untaxed. Effectively, every wage earner taking in more than $106,800 pays a smaller percentage of their income into the Social Security program that people who earn less than that amount. But wealthier retirees get better benefits. While Congress has provided for raising this cap slightly each year over the past decade or so, the fairest solution would be to tax all Americans fairly. Lift the cap. Not only does it treat everyone equally, it could eliminate any doubts about the long-term financial security of Social Security and guarantee the stable benefits for all.